The insurance industry is crowded and competitive. As the market evolves, agents and brokers are not necessarily the primary contact for policyholders - insurance marketers must become as focused on direct marketing as they are branding. 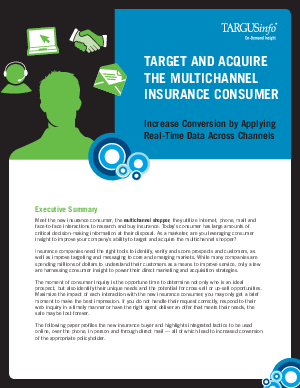 Today's insurance consumer is a multichannel shopper, utilizing Internet, phone, mail and face-to-face interactions to collect critical buying information.